SUMMARY: Perfusion imaging of brain tumors has been performed by using various tracer and nontracer modalities and can provide additional physiologic and hemodynamic information, which is not available with routine morphologic imaging. Tumor vascular perfusion parameters obtained by using CT or MR perfusion have been used for tumor grading, prognosis, and treatment response in addition to differentiating treatment/radiation effects and non-neoplastic lesions from neoplasms. This article is an overview of the utility of PCT for assessment of brain tumors and describes the technique, its advantages, and limitations. In vivo perfusion imaging techniques provide additional information regarding tumor physiology and hemodynamics, which may help in better characterizing glioma malignancy and may also overcome some of the limitations of histologic grading and conventional morphologic imaging. Perfusion imaging has been used to assess tumor grade and prognosis and, recently, to assess treatment response, which has attracted more attention due to the advent of newer therapeutic options, including antiangiogenic agents. 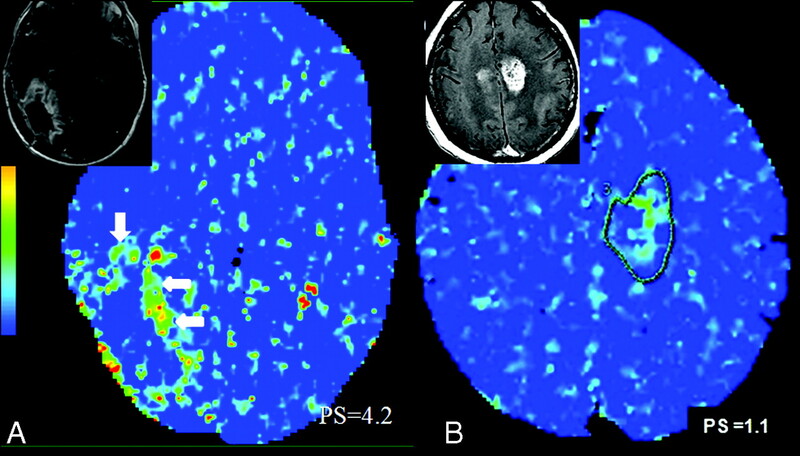 Traditionally, perfusion imaging of brain tumors has been performed with MR imaging, by using various perfusion imaging techniques and estimating tumor blood volume, blood flow, and permeability.3–5 However, PCT, which has also been used recently for glioma grading,6,7 provides a linear relationship between tissue attenuation and tissue concentration of a contrast agent, unlike perfusion MR imaging, and, hence, probably provides a more robust and less biased estimation of hemodynamic (tumor blood volume) and physiologic (tumor vascular leakiness) parameters. In view of the wider availability, faster scanning times, and low cost compared with MR perfusion, PCT is potentially well-suited to study brain tumors6,7 and could potentially be useful as an easy tool for quantitative estimates of perfusion parameters and their use as imaging biomarkers. The current standard for tumor grading is histopathologic assessment of tissue, which has inherent limitations, such as sampling error, interobserver variation, and a wide variety of classification systems that are available, the most common of which is the WHO grading system.3 Most gliomas, especially high-grade ones, show a high degree of regional heterogeneity within the tumor based on tumor cellularity, edema, and necrosis. Many of these factors are inherently dependent on the blood supply. Histologic evaluation of tumor angiogenesis by using various markers such as MVD, MVCP, and TVA is also limited by this regional heterogeneity, and its confounding effect is worsened by its small size and a limited number of samples obtained with surgical biopsy. These limitations can frequently result in inaccurate classification and grading of gliomas due to sampling errors. Hence, there is a need for noninvasive in vivo clinical imaging tools that can study perfusion in the entire tumor, can be used to assess much larger volumes than small biopsy samples, and can probably guide biopsy and excision sites for better results. Regional tumor blood volume measurements reflect an assessment of tumor vasculature and perfusion and have been correlated with glioma grading as well as prognosis. Measurement of tumor blood volume is a good surrogate marker for MVD, a measure of angiogenesis and an important prognostic indicator10–12 in many human cancers. The association between MVD and tumor aggressiveness can be explained by the following: 1) Solid tumors are composed of 2 interdependent components, which include the malignant cells and the stroma that they induce, and MVD could be a measure of the success that a tumor has in forming this stromal component. 2) Endothelial cells in this stromal component stimulate the growth of tumor cells; thus, the more intratumoral vessels there are, the more endothelial cells and paracrine growth stimulation are seen. 3) Intratumoral MVD is a direct measure of the vascular window through which tumor cells pass to spread to distant sites.12 Tumoral MVD, however, does not distinguish new blood vessels from the native ones, does not mark actively proliferating endothelial cells, and does not correlate with the degree of endothelial cell proliferation. However, these limitations do not seem to diminish the clinical value of this measure. Cha et al13 showed a strong correlation of CBV measurements in mouse gliomas with MVD and suggested that rCBV may be elevated due to an increase in vessel size or the total number of vessels or both. Aronen et al14 also showed a strong correlation of CBV and tumor energy metabolism with MVD by using MR perfusion and FDG-PET imaging, respectively. 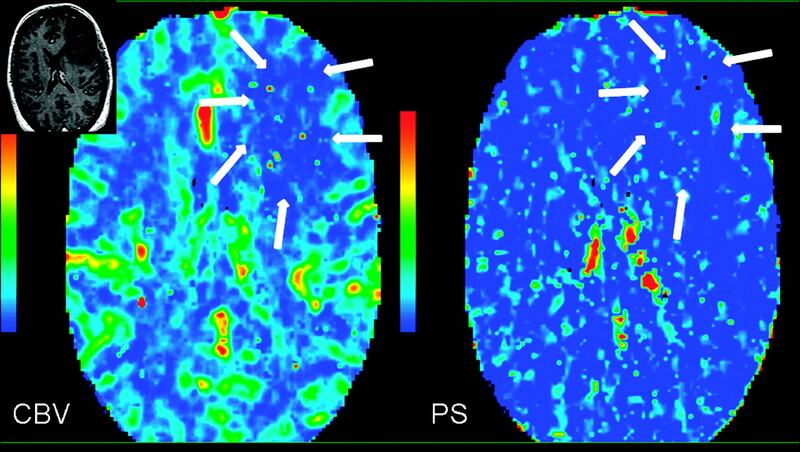 PCT tracer kinetics theory has been described well in multiple previous publications.7,20–23 Perfusion studies can be performed by using multidetector row CT scanners. Currently available 16-section CT scanners can cover 2 cm of the brain, which is increased to 4 cm by using a 64-section CT scanner. A low radiation dose noncontrast CT head study is usually performed to localize the region of interest before obtaining a perfusion scan. For the perfusion scan, 50 mL of nonionic contrast is injected at a rate of 4–5 mL/s through an intravenous line by using an automatic power injector. At 5 seconds into the injection, a cine (continuous) scan is initiated with the following technique: 80 kV(peak), 100–120 mA, and 1 second per rotation for a duration of 50 seconds. After the initial 50-second cine scan, 8 more axial images can be acquired, 1 image every 15 seconds for an additional 2 minutes, thus giving a total acquisition time of 170 seconds to assess delayed permeability.7 Four 5-mm-thick axial sections are acquired with the 16-section CT scanner, whereas for a 64-section CT scanner, eight 5-mm-thick axial sections are acquired, resulting in a total coverage area of 4 cm, instead of 2 cm with the 16-section scanner. Maps of perfusion parameters can be obtained by using many of the commercially available software applications. We use an Advantage Windows workstation with CT perfusion 3.0 software (GE Healthcare, Milwaukee, Wisconsin), a 2-compartment model based on adiabatic approximation of the model of John and Wilson,23 to generate CBV, CBF, MTT, and PS maps in our patients. The superior sagittal sinus is generally used as the venous output function, and the artery with the greatest peak and slope on time-attenuation curves, as the arterial input function. A region of interest is drawn within the confines of a large vessel, and the automatic function of the software picks the pixels with the greatest peak and slope on the time-attenuation curve for analysis. Most of the literature regarding the utility of perfusion imaging for glioma grading is based on various MR perfusion techniques. Recently, PCT has also been used to grade gliomas on the basis of perfusion parameters.6,7 Ellika et al6 were able to differentiate low- and high-grade gliomas with a high sensitivity (85.7%) and specificity (100%) by using PCT and a CBV normalized relative to a normal-appearing contralateral white matter threshold of 1.92. This relationship between CBV and histologic grade is intuitive because pathology studies show higher MVD in higher grade tumors. Jain et al,7 apart from differentiating low- and high-grade gliomas (Figs 1 and 2), could also differentiate a high-grade tumor group into grade III and grade IV on the basis of PS measurements that showed a stronger predictability compared with CBV, and they especially could differentiate enhancing grade III from grade IV on the basis of the differences in PS. This result is in keeping with the current WHO guidelines of including MVCP as a diagnostic criterion of grade IV, but not for grade III astrocytic tumors, suggesting that PS measurements could show better correlation with MVCP and, hence, could be an imaging biomarker of more immature and leaky blood vessels. Increased angiogenesis in grade IV tumors is characterized not only by an increased number of vessels compared with grade III astrocytic tumors but also by association with disproportionate lengthening, increased pliability, endothelial cell proliferation, and irregular shape, which can explain the difference in perfusion parameters for grade IV compared with grade III tumors. Nonenhancing grade III tumors have also been shown to have lower mean PS, CBV, and CBF compared with the enhancing grade III group.7 This difference is probably due to the higher MVD seen in enhancing tumors compared with that in the nonenhancing group. This could have prognostic implications because the enhancing grade III tumors show higher PS, CBV, and CBF, which may indicate more aggressive tumors with a higher recurrence rate and shorter survival periods compared with the nonenhancing grade III, which remains to be determined. Previous studies using MR perfusion have described various rCBV threshold values for glioma grading. Lev et al24 described a threshold of 1.5 in discriminating patients with low- and high-grade gliomas with a sensitivity and specificity of 100% and 69%, respectively. Law et al25 showed a sensitivity and specificity of 95% and 57.5%, respectively, by using 1.75 as the threshold value for rCBV. 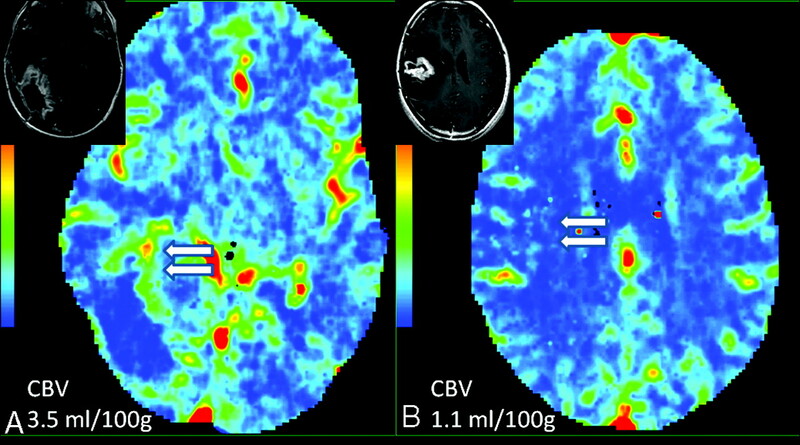 CBV and PS perfusion CT maps in a 45-year-old woman with WHO grade II astrocytoma show low blood volume (CBV = 0.70 mL/100 g) and low permeability (PS = 0.65 mL/100 g/min) within the tumor (arrows). Inset: Postcontrast T1-weighted image shows a nonenhancing left temporal tumor with no surrounding perilesional edema. 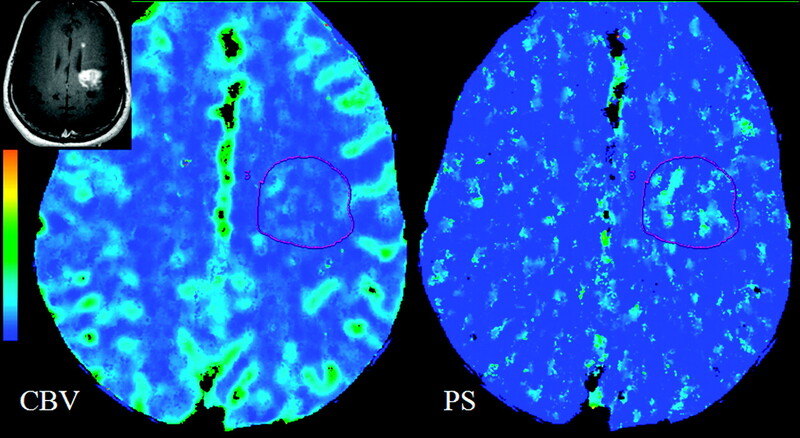 PCT maps in a 50-year-old man with glioblastoma multiforme. The CBV map shows high blood volume (CBV = 4.56 mL/100 g), and the PS map shows high permeability (PS = 3.78 mL/100 g/min) along the enhancing nodular margins of the tumor (arrow). Inset: Postcontrast T1-weighted image shows a heterogeneously enhancing mass with irregular central necrosis in the right parietal region. Tumor angiogenesis involves a multitude of controlled signaling cascades and structural changes that occur in a defined order and continue until a new vasculature has been formed. Tumor cellular growth usually outgrows its blood supply, leading to hypoxia, which leads to expression of hypoxia-inducible factor-1α and the formation of angiogenic mediators such as VEGF and SDF-1.1 The effects of VEGF and SDF-1 lead to formation of immature and leaky blood vessels, which results in increased permeability, leading to extravasation of plasma, plasma proteins, and deposition of proangiogenic matrix proteins as well as MVCP. Later as these pericyte-poor new vessels (called “mother vessels”) enlarge and give rise to “daughter vessels” through a complex series of endothelial rearrangements, MVD and TVA increase; this change, in turn, causes an increase in permeability. Finally with vessel maturation, the total number and area of blood vessels continue to increase more than the vessel leakiness, hence, evolving into a very heterogeneous tumor with various regions probably showing different mixtures of vessel characteristics and angiogenesis, which can be seen as regions with high CBV but not very high PS and vice versa on perfusion imaging (Fig 3). Correlation of various tumor perfusion estimates with histologic angiogenesis markers could thus be very useful as far as in vivo identification of these different regions of angiogenesis is concerned and could benefit clinicians in assessing any therapeutic effects during and after administration of antitumor (or antiangiogenic) agents. MVD could indicate total tumor vasculature, including both mature and immature vessels in the tumor, whereas assessment of MVCP, pericyte-poor neovessels, and VEGF expression would indicate immature vasculature and, hence, sites of active angiogenesis. In a recent study, we have shown that CBV showed a stronger correlation with MVD (r = 0.596, P < .001), whereas PS showed a stronger correlation with MVCP (r = 0.546, P = .001), by using image-guided biopsy specimens. These findings suggest that these 2 perfusion parameters represent different aspects of tumor angiogenesis and in vivo identification, which could be of clinical importance.26 Better understanding of the histologic basis for these hemodynamic and physiologic parameters could help increase their use as imaging biomarkers. PCT maps in a 39-year-old woman with heterogeneously enhancing grade III glioma involving the left temporal lobe. CBV and PS maps show an enhancing region laterally. Region of interest 7 demonstrates the highest PS (8.52 mL/100 g/min), but not the highest CBV (4.73 mL/100 g) within the tumor; whereas region of interest 8 shows relatively lower PS (1.14 mL/100 g/min) but the highest CBV within the tumor (11.65 mL/100 g), suggesting that there is marked heterogeneity within high-grade gliomas, which could be due to the heterogeneity of tumor angiogenesis. Inset: Postcontrast T1-weighted axial images show a heterogeneously enhancing left temporal lobe tumor. A, A 56-year-old man who was previously treated for a right occipital anaplastic astrocytoma, shows a progressive enhancing lesion in the medial aspect of the surgical resection cavity (inset) and PCT CBV map shows high CBV (CBV = 3.5 ml/100 g), suggesting recurrent/progressive tumor (arrows). B, Histopathology proven radiation/treatment necrosis (arrows) in a 34-year-old woman who underwent radiation and chemotherapy for a right fronto-parietal anaplastic astrocytoma shows low CBV (CBV = 1.1 ml/100 g) in a recurrent/progressive enhancing lesion (inset). A, Same case as in Fig 4A. PCT PS map shows high PS (PS = 4.2 ml/100 g/min) in the medial aspect of the surgical resection cavity (arrows) in a histopathology proven recurrent/progressive tumor (inset). B, A 41-year-old man with initial diagnosis of WHO grade II astrocytoma received chemotherapy and radiation. A 33 month follow-up MR image (inset) shows development of a recurrent enhancing lesion. PCT PS map shows low PS (PS = 1.1 ml/100 g/min) suggesting radiation necrosis. The patient underwent open biopsy and histopathology revealed radiation necrosis without viable tumor cells. Histopathology-proved TDL in a 45-year-old woman who presented with a very heterogeneously enhancing large lesion in the left frontoparietal periventricular region (inset). PCT CBV and PS maps show low to minimally increased blood volume (CBV = 1.01 mL/100 g) and permeability (PS = 0.40 mL/100 g/min), unlike a high-grade tumor that it was mimicking on postcontrast images, hence, suggesting a non-neoplastic lesion. Similarly, various vasculitis and angiopathies can rarely present as solitary or multiple masslike lesions, mimicking neoplasms on morphologic imaging. PCT can be used to exclude a neoplasm by demonstrating low blood volume in these lesions (Fig 7). Lymphomas rarely can have an imaging appearance similar to that in high-grade gliomas, particularly if complicated with hemorrhage. However, lymphomas have been shown to have an intermediate increase in CBV compared with the very high CBV seen in high-grade gliomas; hence, perfusion imaging can help differentiate the 2 entities preoperatively. MR image (inset) shows a large nonenhancing mass lesion in the left frontal lobe in a 65-year-old man who presented with headaches. PCT CBV and PS maps show low blood volume and permeability (arrows), suggesting either a low-grade glioma (however, this is slightly unusual considering the associated edema and mass effect) or, more likely, a non-neoplastic lesion. The patient underwent open biopsy, which showed amyloid angiopathy. MR perfusion techniques have certain limitations because of the nonlinear relationship of the signal intensity with the contrast, both for dynamic contrast-enhanced imaging with T1-weighting41 and for DSC imaging with T2- or T2*-weighting. In the latter case, when the contrast agent remains intravascular, the method is widely accepted as a relative estimate of CBF and CBV, though there is a possibility for artifacts because of difficulties in assessing the shape and timing of the arterial input function.42 In the event that substantial leakage of a contrast agent from intra- to extravascular space takes place, a strong and competing T1 contrast effect is often noticed in the areas of pathology because of the necessity of the short (∼1 second) TR needed to estimate CBF. As a first-order tactic to minimize the competing T1 contrast, preloading with contrast agent has been proposed with some success.43 However, this approach does not allow an estimate of Ktrans. An alternative has also been proposed.44 To decrease the T1 effect, this approach used a slower TR, lengthening the TR of the experiment, and undermining the estimation of CBF, thus, yielding estimates of only CBV and Ktrans. A further refinement, allowing the estimate of blood volume and producing an index of transfer constant, has been suggested,43 and a dual-echo gradient-echo sequence45 also shows some potential for an index of blood volume and transfer constant. Despite the partial success of these rapid imaging studies, in contrast to CT perfusion, there does not appear to be an MR imaging technique that will reliably quantify CBF, CBV, and Ktrans in 1 experiment. 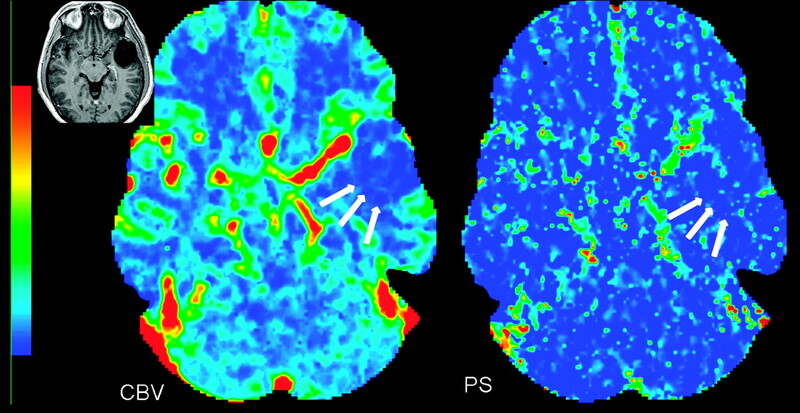 PCT also has the advantage of providing absolute measures of these perfusion parameters, whereas MR imaging estimates are mostly relative to the normal brain parenchyma. Another major disadvantage of MR perfusion is susceptibility artifacts due to hemorrhage and various mineral depositions, which can be a major issue in posttreatment patients with tumor and also more so with dynamic susceptibility-weighted imaging techniques. Despite these findings, MR perfusion has been used more often because MR imaging is the standard of care for patients with brain tumor, whereas PCT requires a separate examination with an iodinated contrast agent. Hence, using PCT as a follow-up tool in patients treated with various combinations of chemotherapy and radiation is not very practical. Radiation exposure is another potential concern of PCT compared with MR perfusion techniques. However, low-radiation-dose protocols with 100–120 mA, as presently used at our center, compared with 200 mA, have reduced the mean effective dose (3–4 mSv) by almost 50%–60% (R.J.; unpublished data) without affecting the image quality of perfusion parametric maps. In addition, some of the advanced image reconstruction techniques, such as adaptive statistical iterative reconstruction, can reduce image noise and improve low contrast detectability and image quality with ≤32%–65% reductions in CT dose index.46 Wider availability and use of these techniques could reduce the radiation dose for PCT studies quite significantly, making them more attractive for routine use. Limited coverage of the brain by using PCT has also been a limitation, particularly with 16-section CT scanners but has been improved to 4 cm of the brain by using 64-section CT scanners and, hence, can cover most tumors. Clinically available perfusion imaging tools whether by using MR imaging or CT can provide additional information regarding brain tumor vascular estimates, which could be useful imaging biomarkers for preoperative glioma grading and angiogenesis assessment and could also be useful for treatment planning and response assessment. PCT has the advantage of providing 2 of the most important tumor vascular estimates (ie, blood volume and permeability) in 1 single experiment as well as providing a linear relationship of tissue signal intensity with tissue contrast agent and the availability of an arterial input function unlike that in most of the available MR perfusion techniques; hence, PCT has the potential to be a useful tool for brain tumor assessment.